ELLIOTT / PATTISON SAILMAKERS offer a full line of cruising, offshore, and charterboat multihull sails. These sails have been developed through years of "on boat" testing and use covering a wide range of real sailing experiences. We have worked with many suppliers in perfecting fabrics, battens, and hardware that will stand up to the loads these big Multihulls develop. 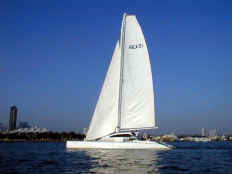 Please visit the pages listed on the left to view details and specifications on the sails we build. For further information or a Quote on your next sail, please Contact us directly.